The Woolwich Ferry is a vehicle and pedestrian ferry service operating between Woolwich and North Woolwich on the opposite side of the Thames. Transport for London's Woolwich Ferry service is currently operated by Briggs Marine. There are three boats but only two operate at any one time during the week and there's a one-boat service at weekends and bank holidays. Pedestrians can also make the journey across by foot in the Woolwich Foot Tunnel under the Thames. Boats run every 5-10 minutes on weekdays. They run every 15 minutes on weekends and bank holidays. The last south to north crossing is 15 minutes before stated closing time. "Is the Woolwich ferry running today?" Sometimes tidal or weather conditions can affect the Woolwich ferry. You can get up to date service announcements regarding the Woolwich Ferry from the TFL River twitter account. 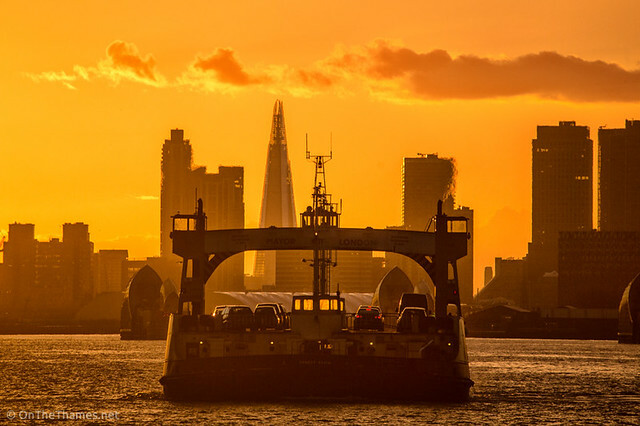 How much does it cost to use the Woolwich Ferry? The Woolwich Ferry is a free river crossing. What are the names of the Woolwich Ferry boats? The vessel names are John Burns, James Newman and Ernest Bevin. Transport for London have committed to investing in two new vessels to operate the Woolwich ferry service. The Woolwich Ferry service is being upgraded in 2018 with two new vessels to replace the existing ferris. 'Ben Woollacott' and 'Dame Vera Lynn' are being built in a Polish shipyard. The new ferries will each be able to carry 40 vehicles and up to 150 passengers.